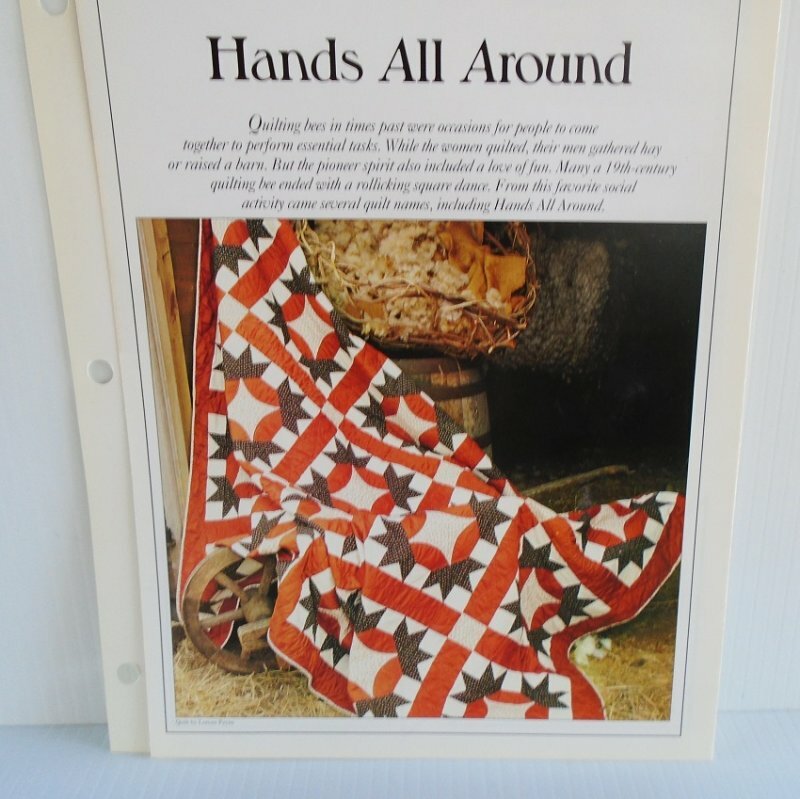 Hands All Around quilt pattern with stencil templates. From Best Loved Quilt Patterns Series by Oxmoor House Inc. 1992. Quilting bees in times past were occasions for people to come together to perform essential tasks. While the women quilted, their men gathered hay or raised a barn. But the pioneer spirit also included a love of fun. 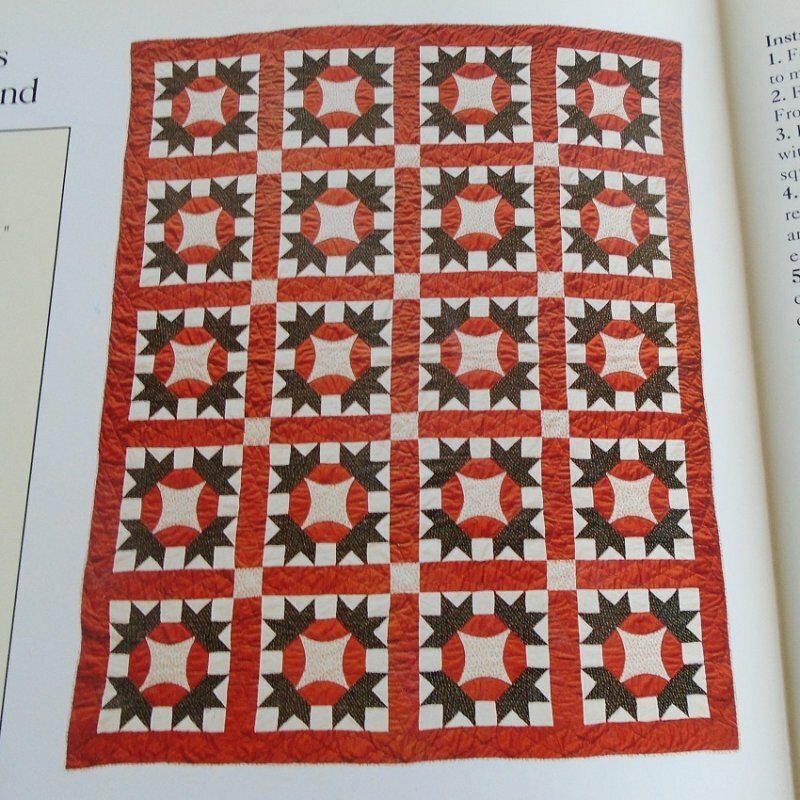 Many a 19th century quilting bee ended with a rollicking square dance. From this favorite social activity came several quilt names including Hands All Around. This is one of probably a hundred quilt patterns that I will be listing. These patterns were part of a monthly subscription series. Each month, the recipient would receive a pack of 3 different patterns. It took a couple of years to obtain the complete set. The pattern and templates offered in this listing were designated in the Diamond and Stars category. You will receive the brochure which tells the finished sizes, fabric requirements, the amount of pieces to cut, and instructions for piecing both a quilt and pillow shams. You will also receive the actual templates that is the exact size needed to cut all the pieces of material. The template is made of a hard, yet flexible plastic. This pattern has never been used. If you receive a templates that appears to have been cut out, that's because when first mailed out, templates for 2 or more quilts may have been imprinted on one 8 by 12 inch template sheet. To provide you with just the templates that you'll need for making this quilt, I had to separate them from unrelated templates. Buyer to pay USPS First Class Mail parcel delivery charges of $2.95. Mailing is from Arizona.